Shas MK Yakov Margi slams UTJ MKs for threatening coalition crisis, says draft law can be adjusted and approved after State budget passes. 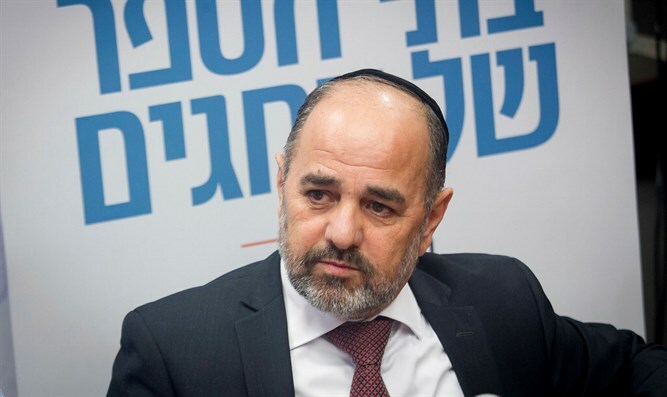 Education Committee Chairman Yakov Margi (Shas) slammed the Ashkenazic-haredi UTJ party for making the passage of the 2019 State budget dependent on the "draft law." The "draft law" would include a new "Basic Law" enshrining Torah study as a basic value of the State of Israel and allowing the government to circumvent a 2012 ruling by the Supreme Court. The ruling, made in response to a suit filed by secular Israelis, declared allowing haredi yeshiva students to defer army service to be discriminatory. "The Ashkenazic-haredi parties made a mistake," Margi told Reshet Bet on Friday morning. "We need to bring a more balanced version of the draft law, and we can advance it even after the budget is approved. That the draft law should pass before the budget is not something to die for." According to Margi, the current coalition needs to be preserved. "We need to preserve the coalition. Interior Minister Aryeh Deri (Shas' leader - ed.) acted wisely, as opposed to Deputy Health Minister Yakov Litzman (UTJ) and MK Moshe Gafni (UTJ)." The United Torah Judaism (UTJ) party consists of two separate Ashkenazic-haredi parties, Degel HaTorah and Agudat Israel, who joined together prior to the 1992 elections. Earlier this week, Litzman emphasized that UTJ's decision not to vote for the State budget unless their draft law was approved first is "in accordance with Agudat Israel's Council of Torah Sages' ruling." The haredi parties are currently discussing possible compromises with Israeli Prime Minister Binyamin Netanyahu.